Fishballs are a popular snack everywhere in Hong Kong, either steamed, boiled in stock, or served with curry sauce. And not just made of fish but of a variety of seafoods including squid, and of course with various meatballs as well. Eaten on a stick from a street vendor, while leaning forward and taking care to not drip sauce on ones shoes, this is a truly Hong Kong experience and on Cheung Chau some of the best known fishballs in all of Hong Kong can be found. 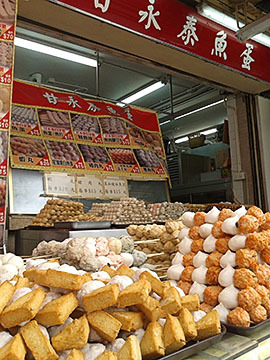 Gan Yongtai fishball shop (pictured) is the best known on the island and is easily found in the large square in front of the ferry pier, underneath the large tree it can be recognised by the large queue people waiting outside. However many other stands on the island have excellent fishballs as well, each of their own style so do try several. As you can see some of the "balls" are in fact triangles, and these are made of bean curd which is set, sliced into shape, and then fried. Served in various combinations on long skewers they are a popular snack for locals to the island as well as visitors. Like many seafood restaurants those on Cheung Chau allow you to bring your own fish which has been purchased nearby either directly from live seafood shops nearby, or from the wet market. In that case only a "cooking fee" is charged when you specify how you would like your fresh seafood prepared. To reach the seafood restaurant street turn left after you leave the ferry pier and walk towards Pak Tai Temple, it is signposted, until you see a cluster of restaurants. While the last in the row, called the New Baccarat Restaurant, is particularly well known each of the restaurants including Hong Kee and So Bor Kee can provide a good meal. To reach the wet market and buy live or fresh slaughtered seafood turn right after leaving the ferry pier and walk along the waterfront until you see the large multi level municipal services building. The seafood vendors are upstairs. There are many other seafood restaurants on Cheung Chau, you will have passed a large one on the way to the market, and conversely while walking towards Pak Tai from the ferry pier one of the first things you will see is the Long Island Restaurant which serves a full menu, including Dim Sum. Cantonese Dim Sum is served by several restaurants on the island from the Bayview Chinese Restaurant in the Warwick Hotel overlooking the beach to the Long Island Restaurant near the ferry pier, and several smaller restaurants inside the village. As a residential district Cheung Chau has no shortage of small cafes that keep up the traditions of the Hong Kong Style Cafe, mixing western and Asian dishes with local ingredients and always a Hong Kong flair. Try the King's Cafe which overlooks the harbour about 100m north from the ferry pier and try their famous Giant Fresh Orange and Lemon Juice, or towards the south of the island in a square beyond the public market building is Coffee or Tea which serves both Cafe and Cantonese dishes in a delightful alfresco environment. Morocco's Bar - Serving both Pub Grub, traditional Indian Curry and Thai dishes this well established watering hole overlooks the sea from a location just next to the ferry pier. Try one of the international choices of beer to go with a Chicken Tika or Rogan Josh, and pair it with a Thai fried rice for some variety!